In my patterns, I often call for gathering. There are many ways to get the job done, but some are easier than others. This video by Needlepointers, goes through the steps of how easy it to gather with a zigzag stitch and your bobbin thread. 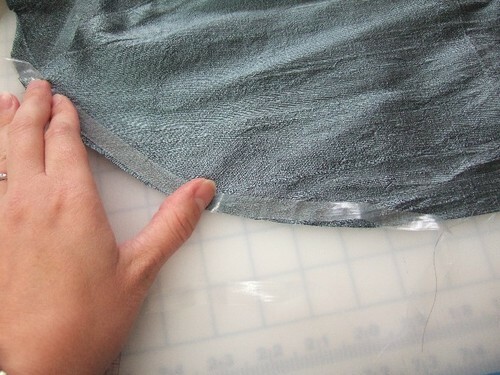 I don’t usually use this on doll clothes, but more for larger garments. Katrina, from Studio Katrina writes about how she uses the clear elastic in her garments to gather to make it easier with more light weight fabrics here. I have done it with different weights of fabrics and I’m happy with the results each time. The key is to stretch it out a bit prior to using it. What I do make a mark where I need to end and stretch it as I’m sewing. I hope these two examples help you gather without pulling your hair out and speed up your sewing. If you have another favorite method, leave us a comment and I’d love to check it out!